The Conversion Pros – Scam or Legit? Read My Honest Review Before Joining! 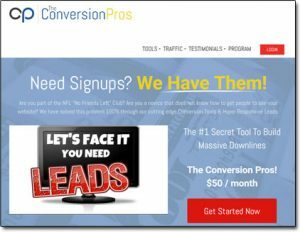 They make it seem like you can just sign up & use their tools to start making money from your business, even if you’re no good at getting traffic or leads… But is it actually legit, or is The Conversion Pros a scam? What Exactly Is The Conversion Pros? If you’ve joined an MLM, business opportunity or have any kind of offer that you’re trying to promote online & struggling in doing so then The Conversion Pros website claims it has the answer. They claim to provide you with all of the tools & responsive leads you could ever need so that you can build a thriving business online, even if you’re no good at generating traffic & leads yourself – which as you likely know are the lifeblood of any online business. It seems that The Conversion Pros primary target audience is as I mentioned above, people inside of MLM or network marketing business opportunities – but ultimately there service is open to anyone looking to succeed online… Even if you’re just a newbie trying to push some affiliate offers. But on top of the tools they also offer lead packages – so basically they claim to fix you up with people who are already interested in whatever it is you have to offer, which should ultimately help you to generate more sales. And it’s worth pointing out that it’s not traffic or “clicks” they’re providing you with (like many other companies do) – with The Conversion Pros you’ll be handed actual leads, so names, email addresses & phone numbers of people allegedly looking for whatever it is you’re offering. So if you’re pushing a weight loss product, The Conversion Pros claim they’ll be able to fix you up with people looking to lose weight. The only problem here though is that the selling is still left down to you – so if you haven’t quite mastered the art of selling then it doesn’t really matter how many leads you get, you’re still probably not going to break a profit… In fact if this is the case then spending money on leads might only end up see you losing money instead. Are The Conversion Pros Tools Any Good? At a cost of $50 per month The Conversion Pros for many will likely be deemed a pretty expensive program – so the question you’re likely wondering is are you really going to get good bang for your buck? Well I’ll be honest & say that yes, in my opinion The Conversion Pros do actually provide a pretty awesome array of tools that could certainly help you generate leads & effectively follow up with them / convince them to buy. In my opinion it’s therefore pretty much safe to say that they do provide pretty good value for money. Some services like LeadPages for example charge $25/month just for you to create capture pages – and realistically this is only their introductory plan… Their Pro plan (the one you’ll likely need) actually costs $49/month. So money wise The Conversion Pros isn’t too bad at all… But what about the leads? Are The Conversion Pros Leads Any Good? That’s because once you’ve bought the leads you’re going to be entirely responsible for getting them to purchase whatever it is you’re promoting. If you can’t do that, then you ain’t gonna make any money even with the best leads in the world. But yes, from what I’ve seen it does seem that as far as leads go, The Conversion Pros apparently provide some pretty decent ones! Obviously out of the three you’re likely going to find better results from the weight loss leads than the other 2 since these are already narrowed down. The biz-opp & female leads are a bit more generic, meaning less chance of them being interested in specifically whatever it is you’re offering. I would like to see a wider variety of leads being introduced, as at the moment they’re pretty limited – but who knows this may happen in the future as The Conversion Pros as a whole is still relatively new. However if you don’t then you can actually promote The Conversion Pros website itself & earn money by getting people to sign up. It seems like that’s what quite a lot of people are doing, and that’s likely the reason why The Conversion Pros has quickly become so popular. I’ve even seen dedicated websites being setup (such as the TCP Lifestyle System) promoting The Conversion Pros membership so clearly people are hoping to make some good money from it. And there definitely is the potential to do so because The Conversion Pros offer 50% commission on all sales… So if you make a sale of the $50 per month membership then you’ll earn yourself $25 per month in recurring income for as long as that person stays a customer. It all works in a similar way to Online Sales Pro which is a very similar company that launched a company of years ago. When that company first launched it too gained a lot of fast traction like The Conversion Pros has, but then it died down shortly after and to be honest I haven’t actually seen anybody promoting it in a while. So The Conversion Pros may be a pretty hot offer to promote right now whilst it’s new, but with regards to it’s longevity it might not be so great… Unless of course they really do keep on improving it & keep on top of the market. Only time will tell though! But the commission rates certainly not too shabby & they do definitely provide some pretty useful tools. My Verdict – Is The Conversion Pros a Scam? No, it’s definitely not a scam – in my opinion The Conversion Pros is actually pretty cool & the tools they provide you with could certainly prove to be useful if you’re looking to increase sales or build an MLM downline online. The only slight concern I have about it is that because of the fairly lucrative affiliate program, many people are trying to get you to buy into it by promising that you’ll be able to make money with it… Rather than promoting it for the tools it actually provides you with if that makes sense? Sure you might be able to make money by doing this but if you’re sold into The Conversion Pros this way then you’ll likely find yourself a little bit disappointed & you could potentially end up losing money rather than making it. Overall though The Conversion Pros could come in pretty handy if you’re already involved with a business opportunity or promoting an offer of your own. If you don’t happen to yet have anything to promote then rather than jumping in at the deep end & trying to promote The Conversion Pros without training, I’d recommend you get started with a free program like Wealthy Affiliate where you’ll actually learn how to promote things & make money online first. My Home Job Search Review – Can You Trust Them? Money Come First Review – SCAM or Legit? My Freelance Paycheck – Scam or Legit? Read My Review Before Joining!